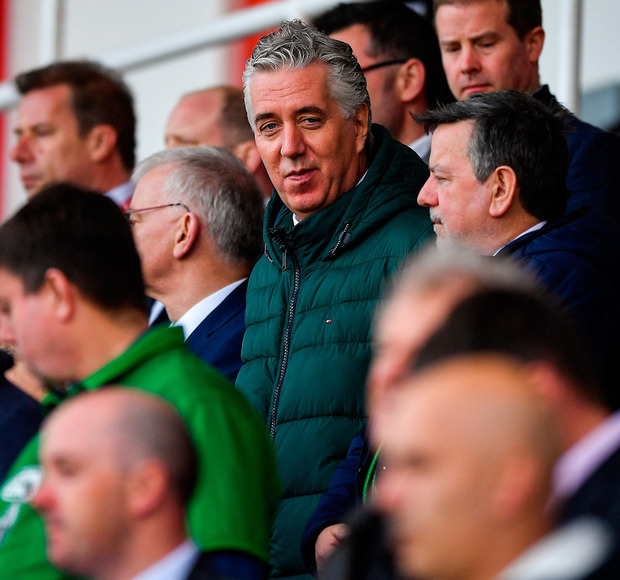 A JUNIOR football club has distanced itself from a statement made by the North East Football League [NEFL] in support of John Delaney and said they have never been asked for their opinion on the FAI’s former CEO. A statement was released on Thursday night by secretary of the NEFL Gerry Gorman outlining the league’s support for Mr Delaney and pointing out the achievements of the FAI’s new Executive Vice President. But NEFL club Ardee Celtic said they did not support this statement and were not consulted with Mr Gorman confirming to Independent.ie that clubs were not asked for their opinions prior to its release. Mr Gorman said Mr Delaney had “assisted us in getting the maximum grant aid for sporting facilities here on numerous occasions”. Mr Gorman had said they backed the support already offered by provincial football councils in Leinster, Munster, Connacht and Ulster. “All in the grassroots game… fully believe he is the person to continue his work with UEFA and FIFA matters in his new role as Executive Vice-President,” they said. In a statement released online last night, Ardee Celtic said they had not been asked their opinion on Mr Delaney. “As a member club of the North East Football League, Ardee Celtic FC would like to put it on record that last night’s statement by the NEFL is not representative of our club’s stance on the FAI’s Executive Vice President,” the statement read. The club added that if the statement represented Mr Gorman or the league committee it should have been indicated within the statement. Mr Gorman said that “as a nation we are famous for embracing and displaying our appreciation for our heroes”. “A minority of our citizens can sometimes do the opposite with unsubstantiated mean’s that can be potentially damaging to a person’s credibility.